"Wisharoo Park is proud to partner with Capezio. Dedicated to the art of dance since 1887, Capezio revolutionized the dance world with dancewear and footwear products for every dancer from beginner to professional. Capezio operates retail stores carrying the full lines of all Capezio/Ballet Maker Inc. brands in New York City and several major cities nationwide. For more information, visit http://www.capeziodance.com/." 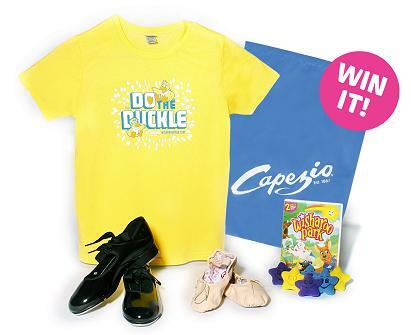 Wisharoo and Capezio bring you The Duckle Dance Contest! "To kick-off the promotion, Wisharoo Park and Capezio premiered its inaugural Duckle Dance promotional video, featuring favorite Wisharoo Park characters Ranger Rosey and DanDan and Della Duckle dancing along with real life kids, at the newly launched multimedia Wisharoopark.com." "Once familiar with the dance, we invite kids to follow the steps or create and perform their very own version of all or any part of, the Duckle Dance -- either to the ballet or tap music provided at the entry site and have their parents capture their performance on video. So what is the Duckle Dance? It’s a little bit of ballet, a little bit of tap, and a whole lot of whatever you want it to be but, most importantly, its moving and grooving family fun for all! Be sure to keep in mind that although our promotional Duckle Dance video teaches specific dance steps, the Duckle Dance Sweepstakes Presented by Capezio and Wisharoo Park is all about fun and dance submissions are completely open to individual interpretation. In the Duckle Dance no step is wrong, no leap falls short, no tap is off, no plié is blasé and no arabesque is grotesque. The sky is the limit as Capezio and Wisharoo Park applaud and salute the creativity and individuality expressed by each and every entrant with prize winners to be chosen through a random drawing. Once captured on video parents can enter their child’s performance in the Duckle Dance Sweepstakes Presented by Capezio and Wisharoo Park for a chance to win the special prizes and/or dance scholarships provided by Capezio and Wisharoo Park. To enter parents simply upload the video to their facebook or YouTube account, and then visit www.wisharoopark.com/duckledance where they submit the facebook or YouTube video link as part of the easy entry process. The Duckle Dance Sweepstakes Presented by Capezio and Wisharoo Park is open now through September 1st, 2011 for video submissions. It presents countless opportunities for preschool dancers’ Duckle Dance videos to spiral out over the Internet as the next viral video stars. In keeping with Wisharoo Park’s mission, the promotion is intended to encourage children to 'get moving' and help them build confidence and self-esteem, encourage innovation, and above all have fun!" What we thought: A is absolutely in love with her new ballet and tap shoes! It is very rare to find her walking around barefoot now:) She loved watching The Duckle Dance and is on her way to making up her own version:) All of the items in the prize pack are wonderful and this sweepstakes is going to be super fun! We encourage everyone with a little one to enter to win some of the super awesome prizes and have a blast in the process:) ABCD Diaries gives Wisharoo Park and Capezio an A+! 10. Enter The Duckle Dance sweepstakes +5 entries!! Disclosure: ABCD Diaries was given Wisharoo Park and Capezio goodies for review purposes only. We were in no other way compensated. The opinions expressed in this post are ours and ours alone. I am a fan of Wisharoo Park via Facebook as Jill Myrick. I am a follower; this would be for my nieces! I follow on GFC (Steph) and I think this Duckle Dance is super cute. I entered the Charm Country giveaway. I signed up for the Wisharoo Park newsletter. I follow Wisharoo Park on Facebook under the username likwan. I follow Wisharoo Park on Twitter under the username likwan. I tweeted about The Duckle Dance sweepstakes on Twitter at https://twitter.com/#!/likwan/status/107323182331084801. I tweeted about this giveaway on Twitter at https://twitter.com/#!/likwan/status/107324015516975105.